And, for you, their melting was a sadness. But I’m glad to see the icicles go. Austere consolations for day’s shortness. Yet I’m glad to see the icicles go. But second, third, nth selves overdue. And such, the sum (less entropy) zero. So I’m glad to see the icicles go. 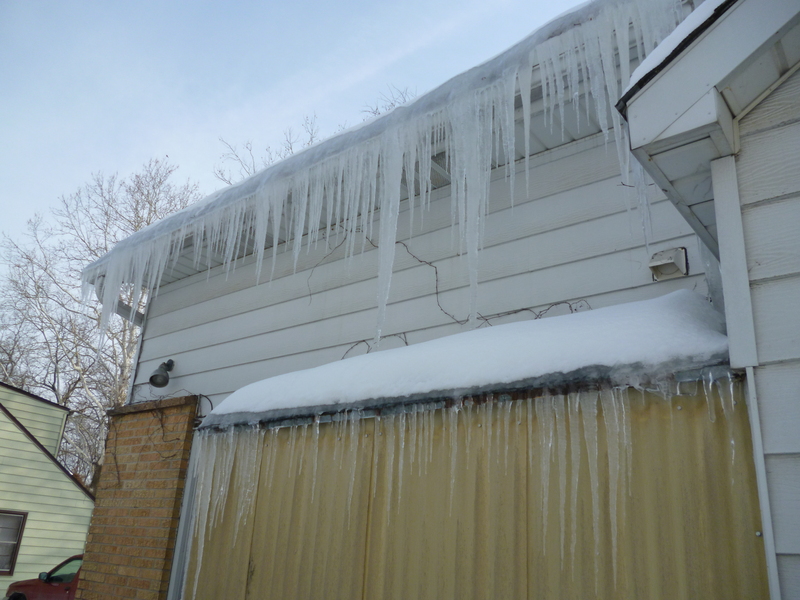 I’ve been thinking about Janet Frame’s “The Icicles” a lot over the last few months, with the snowy/icy winter we’ve had and the tendency of my current apartment building, which is very poorly insulated, to have huge icicles (see photo). I took the ballade as my chance to clarify these thoughts., trying to honour Frame’s poem while articulating my own interpretation. I read “The Icicles” here in term’s of the now-famous story about Frame’s narrowly averted lobotomy (a leucotome is the instrument used to perform the procedure, the “blow” being when the instrument is driven through the skull into the brain). Frame had struggled with mental health problems for years and was scheduled for a lobotomy, which was cancelled only days out when Frame’s first book won a major literary prize. Perhaps it’s presumptuous of me to read this in, but it seems to me that someone who’s been days away from losing a significant part of themselves – in the most concrete, literal way – would have good reason to prize coherent identity and lament the loss of self. By far the toughest part of the poem was rhyming so heavily on the same sounds, especially the twelve “B” rhymes (lines 2,4,5 & 7 of each stanza) – which is why there isn’t an envoi stanza. I really like the sound effect of all that repetitive rhyming though, so I think it was worth the effort. Rather than classical references I have scientific references, which seems to me a reasonable updating of world-views. Also, desire lines isn’t a poetic turn of phrase – it’s a technical term for a path created by foot traffic, usually representing the shortest path between two points, so those bare lines you see across parks or institutional lawns where everyone cuts across. Desire lines are the neatest and I’m really glad I found a place for them in one of these poems. Dead and naked in the water. Oh, they’d walked five miles in. Ballads are such fun – they popular stories, essentially, but with all the fun of also being poems. I went with a murder ballad because I especially love that branch of the tradition, the one that dates back to broadside ballads about current crimes and that has carried cryptic, haunting and brutal stories like “The Knoxville Girl” or “Lamkin.” I think one of the things that attractive about the murder ballad is the way they seem to sidestep any real explanation of the events, yielding to simply representing their violence as a kind of natural force – a pre-Enlightenment, pre-Freudian take on horror. The repetitiveness of the form is great too, letting phrases and ideas slowly build and shift over the course of the narrative, like the son’s request to lie down in “Lord Randall” or the revelation of the origin of the refrain at the end of various versions of the “Twa Sisters” ballad. I didn’t really feel comfortable writing about anything real and horrific so I did an adaptation of the Raymond Carver story, “So Much Water So Close to Home.” I really like this story and I’ve taught it a bunch of times (it works really well in units on feminism). The opaque mystery of the men’s awfulness at the center of the story is perfect for the ballad form. I chose the “excuse” of how far they were from the car as one of the refrain lines, with the idea that it became less and less plausible the more it was repeated. As a bonus, here’s a video adaptation of the opening scene that one of my students made for a class project. This form initially struck me as shallow and gimmicky, so I approached it with the goal of finding some way to work meaningfully with this constraint, some way to make it about more than just being clever enough to do it. I read Christian Bök’s Eunoia, which is made of five chapters – one for each vowel – and exhausts, apparently, 98% of the available vocabulary for each vowel. Eunoia, though, only reinforced my dislike the form, being, to my mind, clever without being intelligent or wise (and also weirdly orientalist and misogynist for someone as young and well-educated as Bök). I got the impression that Bök was expecting me to be clutching at my pearls because his book wasn’t, I don’t know, Billy Collins or Tennyson. I’m all for a bit of the old épater le bourgeois but I feel like the particular bourgeois who would be shocked by Bök’s poem are long dead. But Eunoia sold well and got prizes, so other people clearly liked it. I ultimately failed to find a way into this form, sadly, so I opted to write something as concrete and unpretentious as I could – to resist the tendency of the form to abstraction and cleverness. The only way to to do this is to keep the poem short enough to actually focus on some real referent. I chose hens because I was inspired by Anna’s lovely take on alexandrines, where she leverages the humbleness of the hen against the loftiness of Romantic ideals. I also got some bonus anaphora in here because I guess that’s what happens when you’re working with a severely limited vocabulary. I’m doubling up anaphora and aubade this week, since I just ended up writing a poem about the dawn when I was looking for something to do with anaphora. I had started writing a poem about going back to NZ, having bought my plane tickets this week, which would have worked cleverly with the Greek meaning of “anaphora” – carrying back. It wasn’t really coming together though and I ended up writing this poem instead because I happened to be up early and saw a lovely sunrise. The great thing about sunrises (and sunsets) in winter here is that you get some colour back in the world. 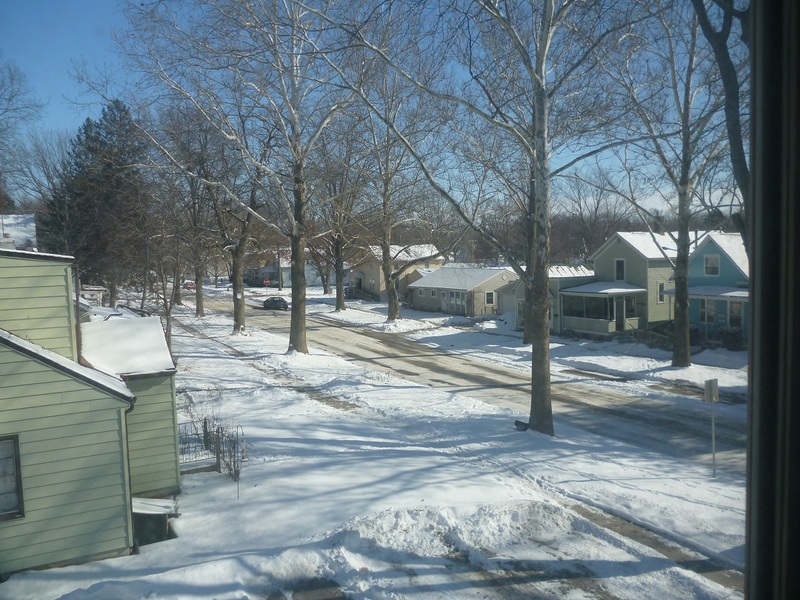 The snow is pretty and all but, as the picture below shows (the view from my living room), it can also be stark and drab. I like the anaphora form for the aubade because the repetition of the “and” (which I love so much in the KJV bible), I think, captures the strange, breathless fastness and slowness of dawn, the way that it both rushes past too fast to fully experience it and yet seems to take so long to finally turn into day.